In a battle between the internet and John C. Reilly, who among us wouldn’t root for the latter? Leave us IMDb.com and a few podcasts, John, but by all means, go smashy-smashy with the rest. Having liberated arcade game characters from their rigidly ordained roles in 2012’s “Wreck-it Ralph,” its sequel, “Ralph Breaks the Internet,” sends our charmingly lopsided duo — the hulking, big-fisted Ralph (Reilly) and the glitchy pipsqueak candy-colored racer Vanellope von Schweetz (Sarah Silverman) — into that expansive netherworld where clickbait lurks and pop-ups proliferate. For a pair of pixelated beings whose existence has heretofore been limited to a handful of video games, they’re decidedly not in Kansas anymore. The web of “Ralph Breaks the Internet” is a strictly PG-rated, sanitized version; there are no dark turns down 4chan alleys or face-to-faces with Infowars conspiracies. But that doesn’t mean there aren’t cruel truths that Ralph must confront in cyberspace — none more than when a crestfallen Ralph sees the responses to his popular viral video. Never read the comments. In trading Qbert jokes for eBay ones, “Ralph Breaks the Internet,” directed by Rich Moore and Phil Johnston, does more than shift the puns. If “Wreck-it Ralph” was a nostalgic “Toy Story”-like trip into ’80s arcade games, “Ralph Breaks the Internet” is more current. It’s ultimately about male-controlling impulses run amok. Life inside the arcade has gotten repetitive for Vanellope, who’s tired of winning the same old rainbow-colored races in her game, Sugar Rush. But while the video-game characters are convening in their Grand Central-like terminal, a new plug labeled “WiFi” arrives above. “It’s either Wiffle ball or an arranged marriage,” says Ralph. Soon after, the impending unplugging of Sugar Rush (due to a malfunction) prompts a kind of migrant crisis. All of the game’s characters flee before they get trapped in the shutdown and need new, adoptive homes. Vanellope crashes with Ralph, but he can see his friend — and their friendship is indeed endearing — is feeling lost. Ralph resolves to journey into the internet to purchase the replacement part that will save Vanellope’s game. Crawling through the router, they speed through optical cables and arrive in an infinite, glittering cityscape populated by towers of tech (Amazon, Google) and byzantine byways of zipping digital avatars. It’s an idealized vision of the internet. There are no trolling Russian bots here, just some distracting ads and a quite charming, bespectacled search engine (voiced by Alan Tudyk) that will try to finish every sentence. The pair’s initial plans prove more complicated once they discover the online world isn’t just a game, but a place dictated by real money. To raise the money, Ralph quickly turns video star, churning out meme-inspired videos with the help of a Buzztube executive (Taraji P. Henson). Many, especially those in newsrooms, will watch with jealousy at just how quickly Ralph is able to monetize clicks. There are other adventures, too. Vanellope finds a far grimier, “Grand Theft Auto”-like racing game called Slaughter Race, a realm presided over by a stylish driver voiced by Gal Gadot. It’s hardly the kind of game that anyone would imagine a good fit for a petite ponytailed pixie. But she thrills to the more grown-up racing world, eager to test her skills. Online, you can find your niche. Other cyber doors are less appealing. In one self-referential diversion, Vanellope walks into a room of Disney princesses. Jasmine, Moana, Cinderella, Ariel, Snow White, Belle and others are sitting around, waiting to participate in an online quiz: “Which Disney princess are you?” They all speak a little similarly (and they note, none have mothers) in a segue of self-deprecation for Disney that’s both a welcome gag and, for the media behemoth, false modesty. There’s much that’s clever in “Ralph Breaks the Internet,” but it’s the film’s heart — thanks to Reilly and Silverman’s voice work and easy rapport — that has made them more than a whiz-bang graphical blast. These are fragile and sensitive protagonists trying to be themselves in a world of pop-culture-prescribed roles. 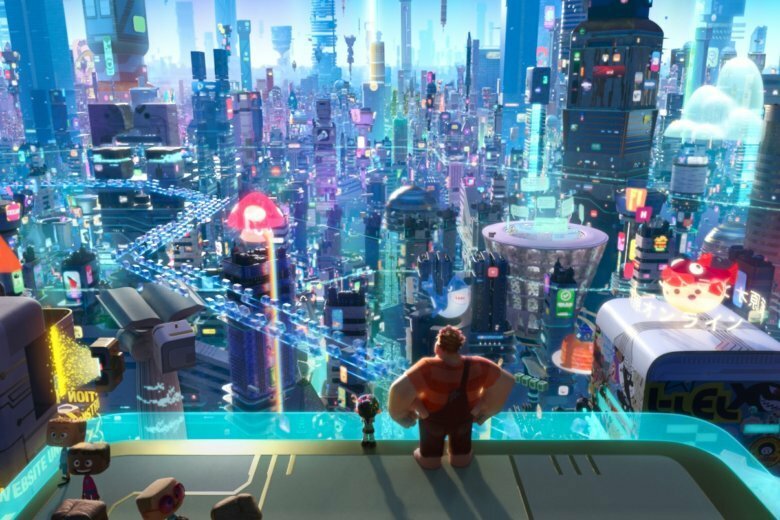 In “Ralph Breaks the Internet,” it’s Ralph who has to do some soul-searching. The movie isn’t always quite up to the task. It would be better if it went further and wrestled more with the online world than used it as another bits and bytes background. Really, it doesn’t quite live up to the title. Ralph could have done more damage. “Ralph Breaks the Internet,” a Disney release, is rated PG for some action and rude humor. Running time: 112 minutes. Two and a half stars out of four.